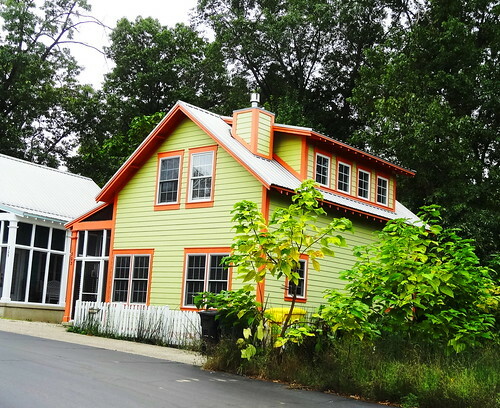 We’re heading south to the Indiana Dunes National Lakeshore for the Century Of Progress Home Tour. We get an early start, surrounded by the blue of the lake and the cloudless sky we’re following the shoreline down; the lake is on the right, stunning beach homes on the left. 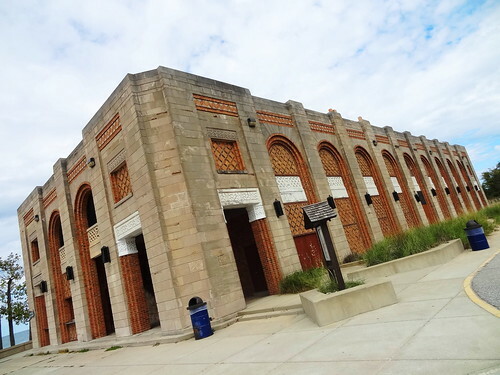 Our tour leaves from the Indiana Dunes Visitor Center at 11:20. 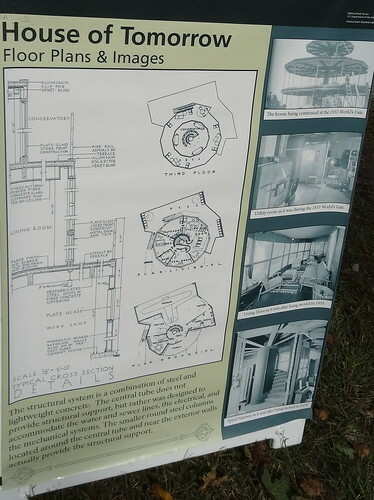 After checking in we have a little time to check out the Century of Progress Historic District display. Here’s a little background on what we’re going to see. 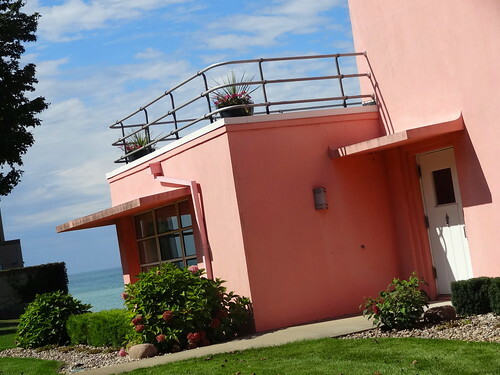 In 1927 Frederick Bartlett purchased 3,600 acres of land along the Lake Michigan shoreline for a planned resort community, the land was plotted into thousands of home sites. 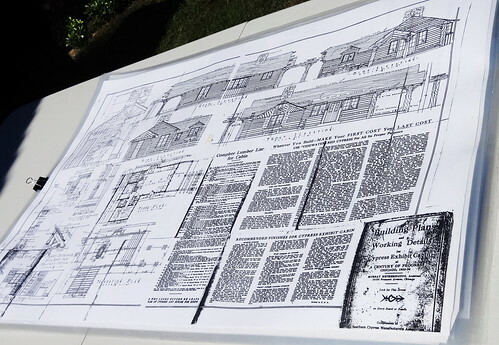 The Great Depression brought the development to a halt, many of the plots were never built on. In 1933 Frederick’s brother Robert purchased the development, he named it after his daughter, Beverly Shores was born. Robert had a brilliant idea, the extremely successful Chicago 1933-34 Century of Progress World’s Fair had come to an end. Why not purchase some of the demonstration homes and move them to Beverly Shores? He did. 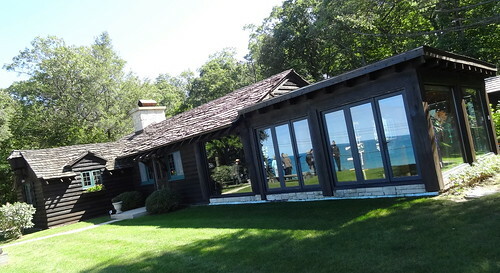 He bought 16 buildings in all, four of the houses on the tour were moved by barge across Lake Michigan to the spot they still sit today; the fifth home was brought by truck. Surely the notoriety would bring publicity to the area and the development. 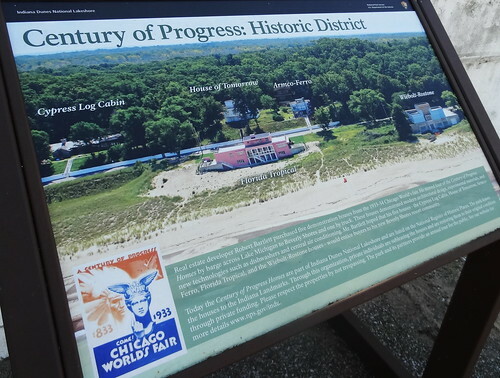 Our tour guide works for the National Park Service, as we drive he explains that with the creation of the Indiana Dunes National Lakeshore in 1966, the National Park service began acquiring land and buildings including the Century of Progress homes. 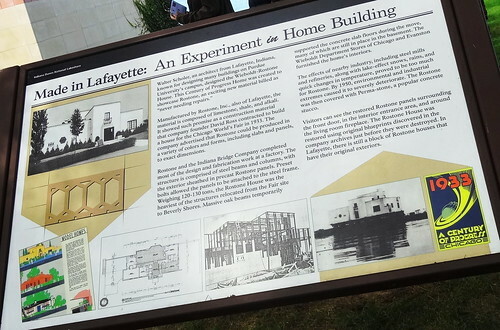 Indiana Landmarks has leased all of the houses from the NPS, subleasing them to private individuals who restore them using their own funds, we’re talking millions. We make a left, soon the lake comes into view, a right turn and the bus parks. All 25 of us disembark, the Armco-Ferro House sits on a bluff to our right, the Chicago skyline can be seen clearly across Lake Michigan. 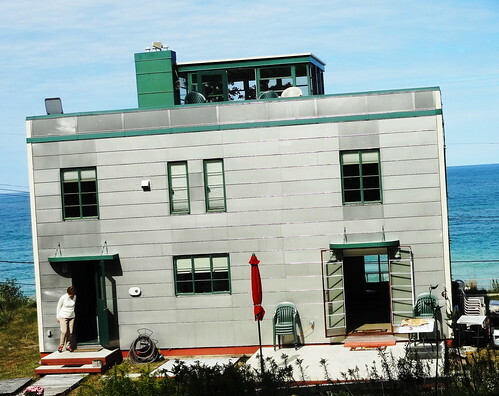 The house was originally all metal; walls, floors and the roof were corrugated steel panels, the exterior panels were porcelain-enameled. 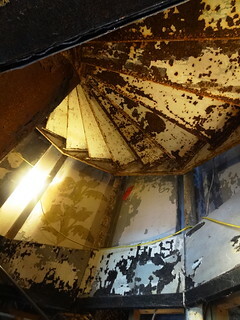 In 1933 the house was touted as having a maintenance-free exterior; over time the elements took their toll, the roof leaked, water got in everywhere, there was rust and deterioration, not to mention the house was basically set on a sand dune. 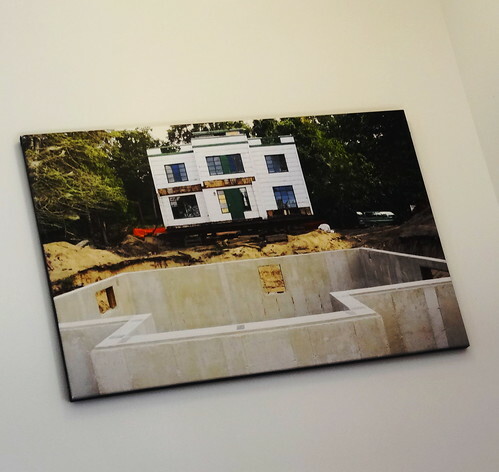 Fortunately for all of us, the perfect people leased the house, they had it raised and a new foundation installed. 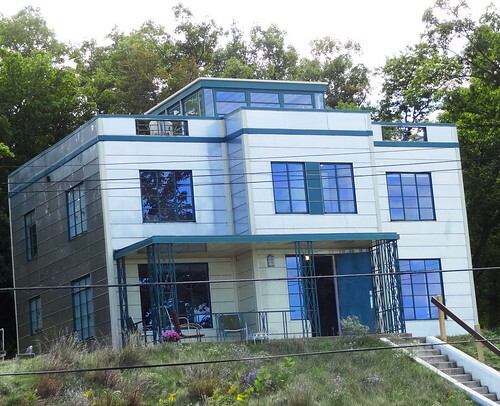 The house has been restored with a mix of old and new materials; exterior panels are now stainless steel, windows are restored originals, it looks awesome! Inside, period furniture fills the rooms, the view from the front windows is exceptional, magazine articles from 1933 are framed and on display. 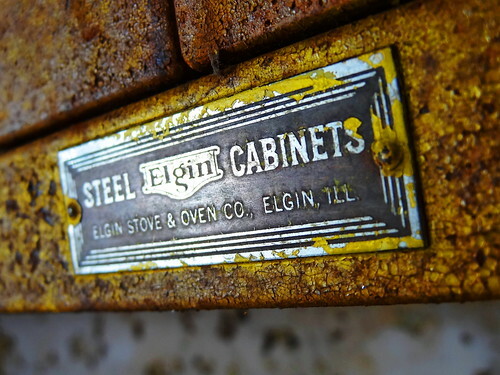 I love the little Art Deco touches. 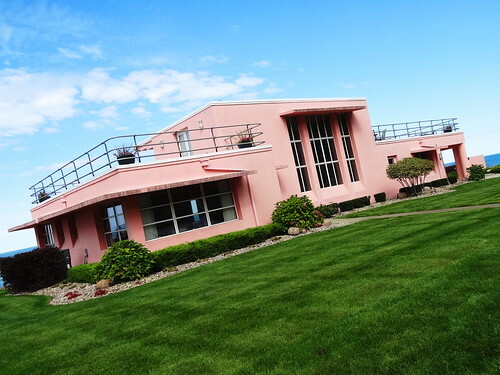 The theme of the 1933-34 World’s Fair was technological innovation, American Rolling Mill Company and the Ferro Enamel Corporation sponsored the first house, the House of Tomorrow was designed and sponsored by Chicago architect George Fred Kreck, he set out to change the direction of residential architecture. 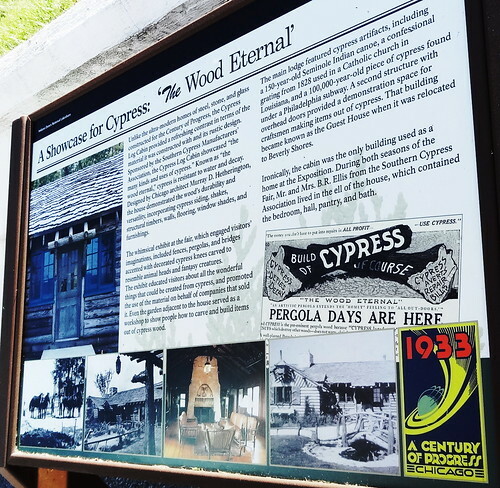 The next house was sponsored by the Southern Cypress Manufacturers Association. 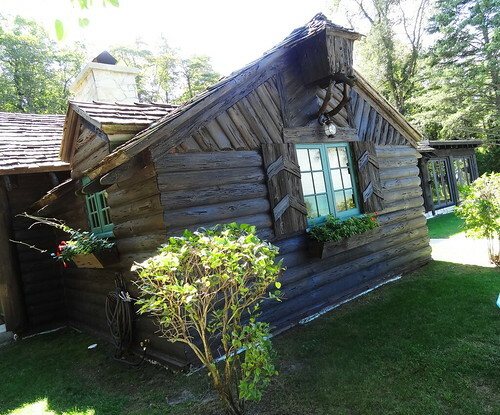 They hired Chicago architect Murray D Hetherington to design a structure to promote cypress as a building material, which brings us to the Cypress Log House and Guest House. As we stand in line waiting to go in Kris and I admire the building, it has all the charm of a mountain lodge; stone chimney, gorgeous dark wood exterior, cedar shingles, window boxes, green-painted window frames, it even has bird houses built into the design. I wish you could see the inside, it looks straight out of a magazine with Martha Stewart as the decorator. Lots of wood, floor to ceiling windows overlooking the lake, a huge stone fireplace; I want to sit down and have a cup of coffee in one of the comfy-looking chairs. 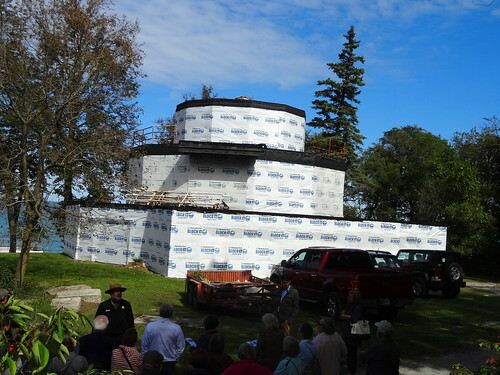 This is the house that was moved to Beverly Shores by truck. It’s lovely. Now remember, this was 1933, the Great Depression still gripped the nation. My father-in-law lived in Chicago at the time, I love to imagine him as the 10-year-old boy that he was, riding his bike around the fair. Visitors got a glimpse of the latest wonders in rail travel, automobiles and architecture. 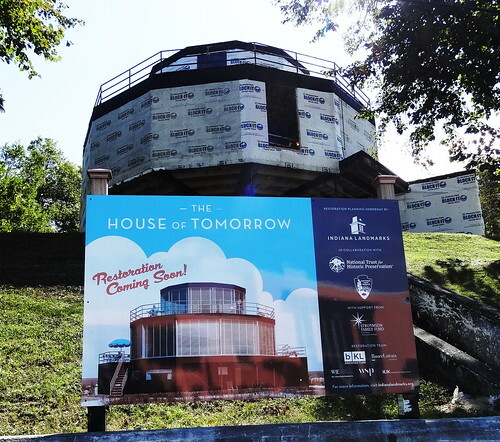 The Houses of Tomorrow exhibit allowed people to dream of a better time with new, modern home conveniences, exciting designs and new building materials. 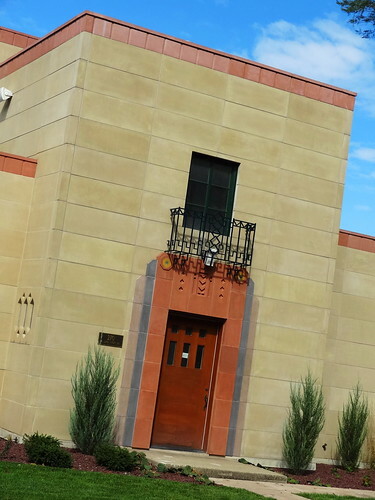 The Wieboldt-Rostone House designed by Walter Scholer blended Art Deco and Art Moderne elements to showcase the use of steel and masonry for a modern family home. The Indiana Bridge Company provided the structural system, including wall framing and corrugated steel roof panels. 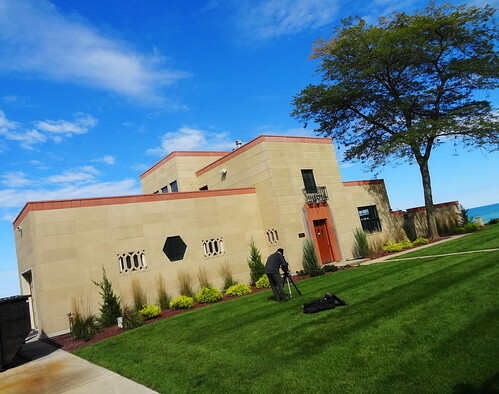 Unfortunately for this house the exterior was clad in an experimental synthetic stone (Rostone) composed of shale and limestone waste. 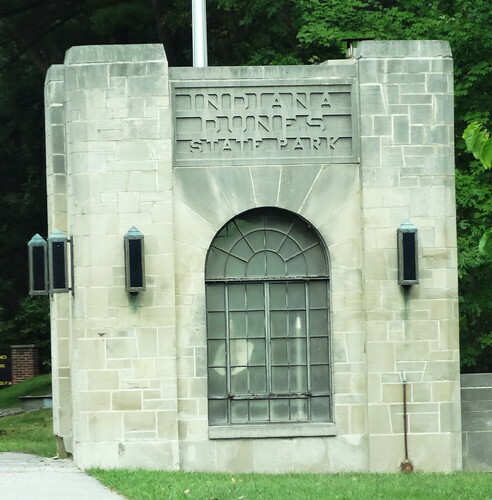 It failed in 1950 and had to be replaced with Perma-Stone. 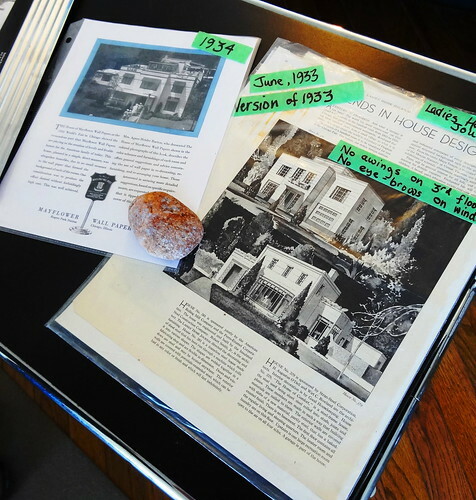 In the 1980’s the Perma-Stone began to fail, the lake levels rose causing problems with the septic field, the roof leaked, damaging the interior. The exterior has been completely restored right down to the landscaping; the original Rostone still surrounds the front door and entry hall. 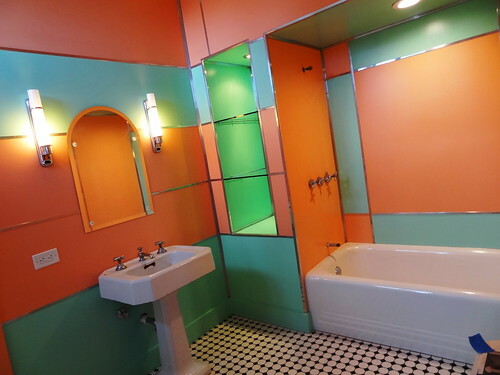 The bathroom managed to survive and in a word its fabulous! The house is right on the beach so the view is amazing. For us the Florida Tropical House was the true gem of the tour. 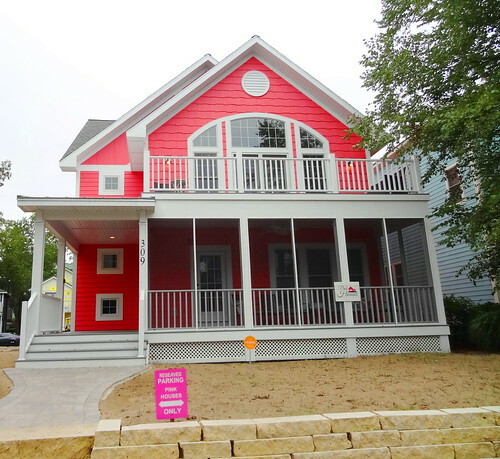 First of all, who can resist a Flamingo-pink-colored house? Second, who wouldn’t want to live on Lake Michigan? Third, who doesn’t love Art Deco? The state of Florida sponsored this house to entice people to come to Florida for a tropical getaway. At that time Florida was in the early stages of becoming a ‘vacation paradise’. From the moment we step in the door I’m speechless, I walk along tapping Kris’s arm and pointing at things; the hand-painted Art Deco murals, the soaring windows, the aluminum hand rails and stairs, decorative door knobs and hinges; truly glamorous in an old-Hollywood kind-of-way. The furniture is all period-perfect, the colors tropical, the overhangs and roof decks, wow–the only thing missing is a Palm tree. The house is magnificent. 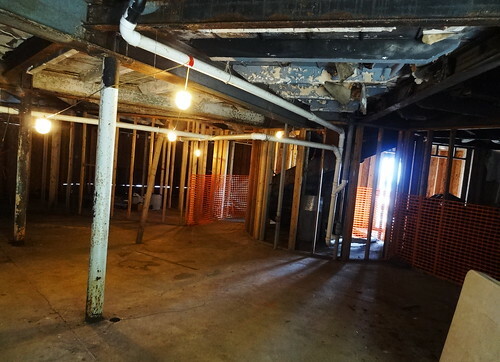 The owner has completely restored the building including installing 192 foundation piers to level it and provide a firm footing. 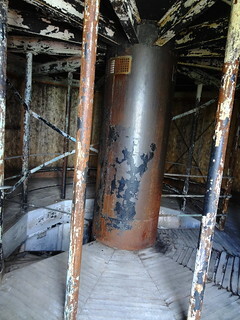 I wish we could show you the interiors but photos are not permitted. Time to load the bus and head back to the Visitors Center. 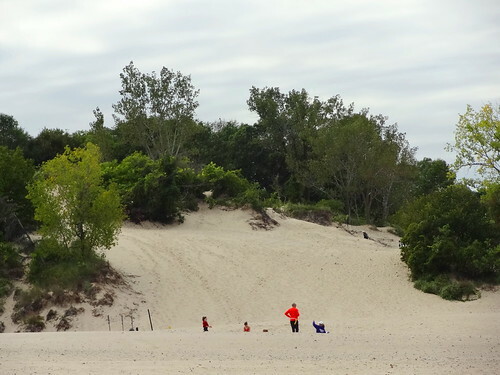 Before heading back we take a drive through Indiana Dunes State Park. 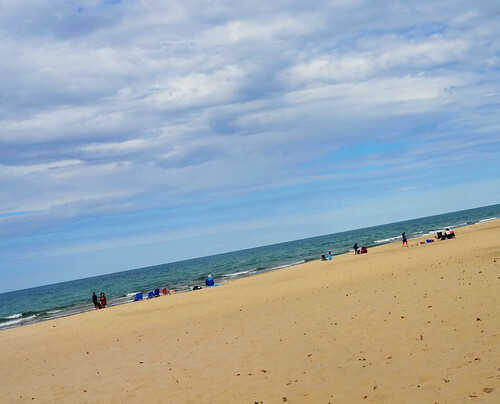 We park and take a walk on one of the beaches, funny we’ve never really explored this part of Lake Michigan before. Old Art Deco buildings stand in sandy parking lots, trees and shrubs grip the dunes, Chicago skyscrapers loom in the distance. We leave the park driving on a two-lane road through forest and wetlands on our way to Michigan City ,we don’t pass another vehicle. We’ve run out of snacks and bottled water, time to get some real food. 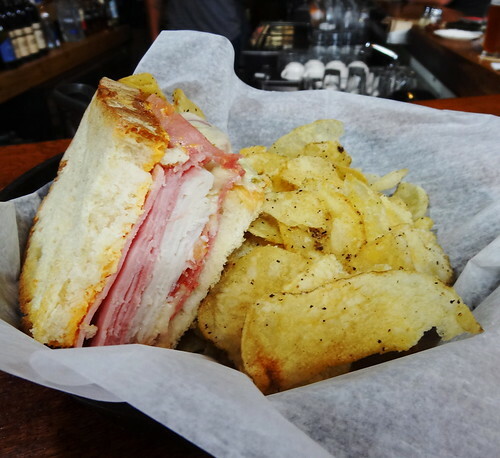 We were out this way last May and found a great little microbrewery in the Elston Grove Historic District, that’s where we’re having lunch. 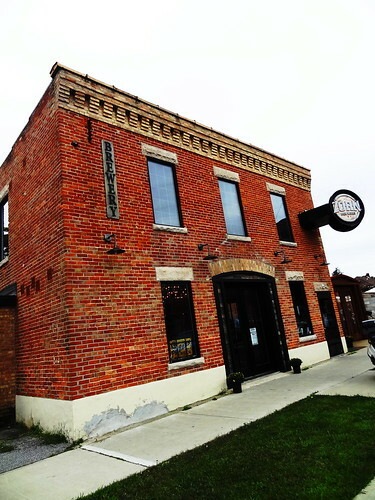 Zorn Brew Works originally opened in 1871 when Bavarian immigrant Phillip Zorn migrated to Michigan City IN to start his own brewery; unfortunately it closed in 1938. 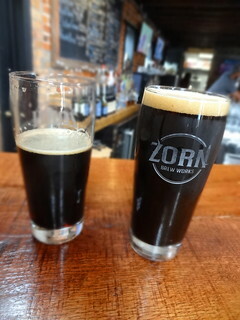 77 years later Michigan City’s oldest microbrewery became its newest as Zorn Brew Works was reborn at 9th and York streets. 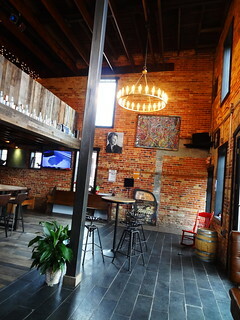 It’s a great old brick building with tons of charm and character from its brass chandeliers to the cool old beer posters and memorabilia. The beer is great, I had the Elston Grove Oatmeal Stout, Kris had the Carriage House double IPA. 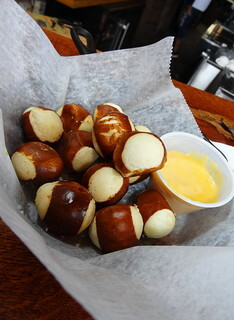 The food is delicious; I could just drink the beer and eat the pretzel bites dipped in beer cheese but then I would miss out on the excellent sandwiches, we had the Zorn, yum! It’s a great place to stop in and just chill out, especially after a busy day like we’ve had. Back up the coast we go, if you really look you can find tiny roads that let you ride along the water, the houses along the shore are pretty amazing too! 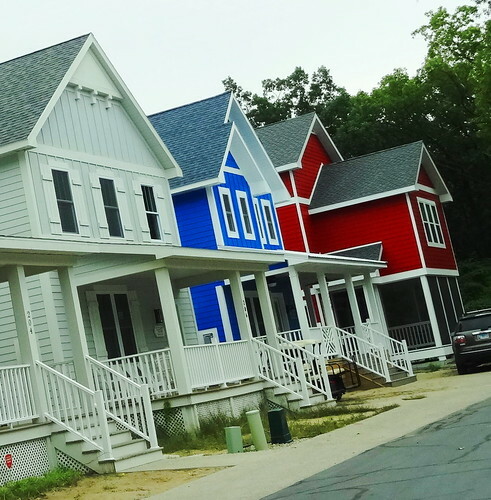 One of our favorite places to drive though in the area is Beachwalk, a resort development of cottages and beach homes that looks like a box of crayola crayons. Let’s take a drive through. The streets wind past lavender, turquoise, lime, yellow, coral and blue cottages. 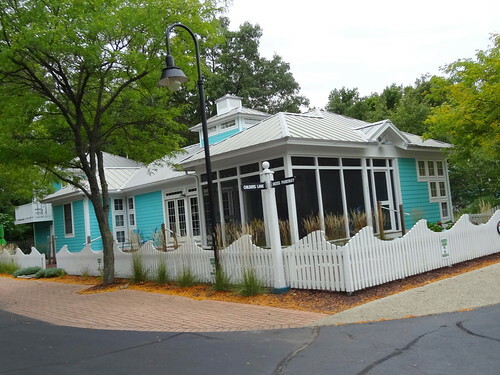 All are surrounded by a white picket fence, sand and dune grass replaces traditional lawns. Homes range from one to three stories, balconies, decks and porches are trimmed out in crisp white. We have been driving through here for years, the development started with 7 homes, today there are nearly 200. Many of the cottages have been closed up for the season, shades are pulled, grills are covered, fallen leaves gather on porch steps. 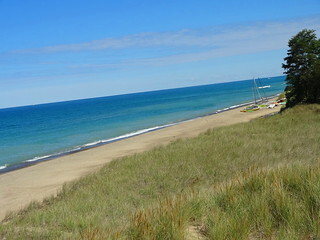 Driving north along the lake we pass through charming beach communities in Michiana, Grand Beach and New Buffalo, I highly recommend the drive. Not only is Lake Michigan gorgeous but the array of houses perched on the bluff is fantastic. You’ll see everything from a traditional brick ranch to an old stucco beauty from the 1920’s, there are Tudors, orange tile roofs, contemporary homes and mid-century moderns. The one feature they all share is large windows; who can resist that view?